Today I set up shop in a new office in Fort McMurray. As anyone who follows me on Twitter knows my regular office is a lovely little coffee shop in downtown Fort Mac called “Coco Jo’s”. I wrote about that coffee shop months ago, and it has become my favourite place to write, meet interviewees, and occasionally eavesdrop on fascinating conversations ranging from the very political to the very personal (and those are the ones in retrospect I often wish I had not listened to – but dammit, I can’t help myself!). Today, however, I set up shop in a new office, far from Coco Jo’s, and in another area of Fort Mac entirely. It’s a lovely office, and a quiet spot in which to write and work. It’s not really my office, though. 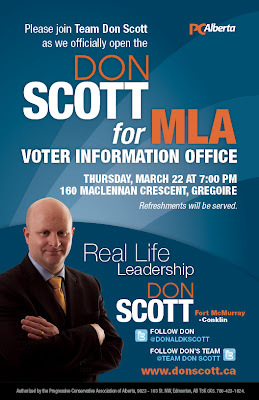 It belongs to all of Fort McMurray in a sense, because it is the Voter Information Office for Don Scott, PC candidate for Fort McMurray-Conklin. And why is this my new office, exactly? Why will I be found here for the next little while, at least until the election is over and all votes tallied? It’s because a few weeks ago I agreed to serve as the volunteer Communications Manager for Don’s campaign. When I was asked to consider this position I was both delighted and daunted. I was delighted with the opportunity to stretch my skills a bit, to take on a new role and see how it fits. I was daunted, though, because I knew it would involve a significant amount of work. It wouldn’t always be easy. It could very well be stressful, and it would be time consuming. It would be a big commitment, and I have, well, a few other commitments (this blog, some paid work, and the Intrepid Junior Bloggers who like to be fed and kept in clean clothing, the spoiled things). Despite the daunting aspects I quickly agreed – and not because I am a political junkie (I’m not – I’m a political dilettante), or for any personal gain. It’s because I believe that when you believe in something – a cause, or a person – then you need to invest in it. And I believe in Don Scott, and what he can do for Fort McMurray. I’ve been watching Don for some time, and even before we became friends. It has been in the last year, though, as we spent time together, that I have seen his passion and commitment to this community. I have seen him work tirelessly to effect change, and I have seen his bold vision for what we can become. I was there when his nomination as the PC candidate in the riding of Fort McMurray-Conklin was acclaimed. In fact the little “tweetup” meet and greet I had arranged that evening turned into an acclamation party of the best kind. You see, over the past several months I have became more and more heavily invested in this community. I have become fiercely protective of it and the people in it. I am not protective in the sense that I don’t see any issues, but in the sense that I know that we need people who can do something about them. We need bold visionaries. We need people of passion, and vision, and drive. We need people who believe in this community, and who can see the bright future ahead – but who are also unafraid to roll up their sleeves and do the hard work required to get to that future. We need leaders like Don Scott. And when his campaign needed me, I said yes, because I believe in him, and in what he brings to the table, and in what he can accomplish. I said yes not because I really want to spend late nights editing press releases or working on drafts that may never see the light of day. I said yes because if I want a representative who is willing to do that hard work then I need to be willing to do that hard work, too – and I am. And that is why for the next little while you won’t see my with my laptop and iPad and iPhone and notebook and fashion magazine and coffee cup (my tools of the trade) spread out at a table at Coco Jo’s, and are more likely to see me grabbing my coffee there to go. Instead you will find me here, in this new temporary office, as I do what I can to effect change in Fort McMurray, and to improve this community. I’m not going to tell you how to vote in this election, people. I also won’t hide where my loyalties lie, and I am, as always, as honest as I can be with you. I will ask you to do one simple thing, though. Just vote. Just make this election the one with the best turnout ever, regardless of where you decide to place your “x”. Invest in this community with your vote, and let’s determine our future together, okay? And just for the record, should you wish to drop by and talk politics, Fort McMurray, community, blogging, shoes, or anything else – well, it’s not Coco Jo’s, but I’ll make sure the coffee pot is on!